Image courtesy of Library of Congress This c.1916 image shows the crypt built for President George Washington. 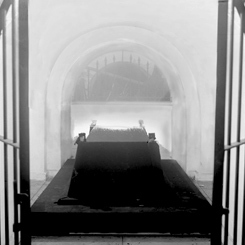 Before the opening of the Capitol Visitor Center, the crypt stored the funeral catafalque built for President Abraham Lincoln. On this date, following the death of President George Washington, the House and Senate resolved that “the family of General Washington be requested to permit his body to be deposited under” a marble monument “erected by the United States in the Capitol, at the city of Washington.” The resolution was sent to Martha Washington, who penned a reply to President John Adams. Despite stipulations in Washington’s will that he be buried at Mount Vernon, Martha consented to Congress’s request, “Taught, by that great example which I have so long had before me, never to oppose my private wishes to the public will, I must consent to the request made by Congress,” she wrote, “. . . and, in doing this, I need not, I cannot, say what a sacrifice of individual feeling I make to a sense of public duty.” President Adams communicated her response to Congress on January 8, 1800, but action on the resolution of 1799 was stalled for years by wrangling in Congress about the cost and what type of memorial was most appropriate. The issue of fulfilling Congress’s resolution was raised in the House by Representative Henry Lee of Virginia in 1800, Representative Benjamin Huger of South Carolina in 1816, and a young Congressman (and future President) James Buchanan of Pennsylvania in 1824. Buchanan noted, “the man who was emphatically first in war, first in peace, and first in the hearts of his countrymen, has been sleeping with his fathers for almost a quarter of a century, and his mortal remains have yet been unhonored by that people, who, with justice, call him the father of their country.” Despite such exhortations, additional resolutions proved fruitless. By late 1829, Capitol architects had begun considering plans to complete a crypt for Washington’s remains beneath the Rotunda. As the centennial of Washington’s birth approached in 1832, Congress renewed its appeal to the Washington family to transfer the patriarch’s remains from Mount Vernon to the Capitol. Though some family members supported Washington’s enshrinement in the Capitol, John A. Washington, the owner of Mount Vernon, would not consent to disturbing what he considered Washington’s “perfect tranquility, surrounded by those of other endeared members of the family.” His disapproval effectively settled the issue: Washington’s remains stayed at Mount Vernon and his intended Capitol crypt remained empty.